Every day, 250,000 animals are transported throughout Canada. Many travel thousands of kilometers from one side of the country to the other or across the border into the United States. 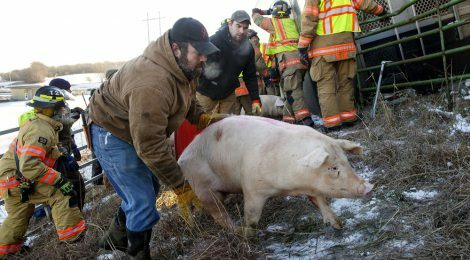 Transport is an extremely stressful event for animals, and trailer crashes, spills or roll-overs seem to have become near-monthly events. Transport Canada is seeking to reduce trailer accidents with its proposed amendment to the Commercial Vehicle Drivers Hours of Service Regulations. The new regulation would require livestock haulers to install electronic monitoring equipment on their trailers to log the number of hours they’ve been on the road. Currently, drivers use paper log books that can easily be falsified. In fact, many drivers have two paper logs — one reflecting the actual number of hours they’ve been traveling and another with the legal allowable limit. Similar regulations were passed in the U.S. in mid-December, although agricultural haulers were given a 90 day grace period before they must comply. The regulation draft is now open for comments. Please send a quick email to Andrew Spoerri, Senior Research Analyst with Transport Canada at andrew.spoerri@tc.gc.ca expressing your support for the amendment.